This is one of my all-time favorite hero cat books! What an amazing combination of great words, fun story, and wonderful illustrations. A very clever cat does some amazing thinking to save the day. The farm where Mabel the cat lives has some unusual trees that are under attack by pirates. Mabel defends her territory! This is a must-have for any cat loving parent of a small child: a great addition to the library. I’m breaking ranks (that’s what you can do with your own posts ;-)…in lieu of book reviews, I’m branching out to gift recommmendations. My goal is always to think about children and the environment above all else. So today, as I’m already fed up with all the commercialism of Christmas, I would love to do my part in supporting some great ideas for the holidays (and beyond). To kick things off, I start with International Cat Care. 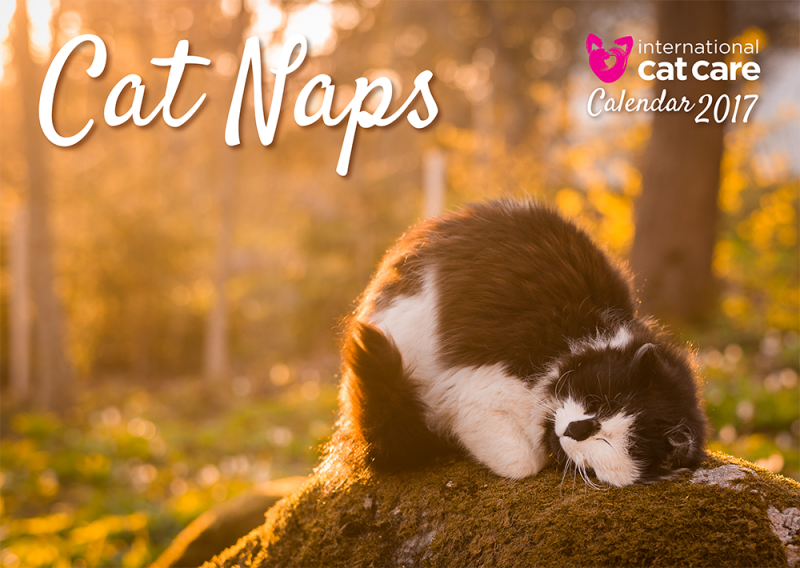 Not only is this organization promoting the well-being of cats, and the happiness of cat owners, all around the globe, they have made a gorgeous calendar for 2017: it’s a superb gift for any of your cat-loving friends…the theme is cat naps! I am in love with Ms November and Mr August: two centerfolds that could grace my walls beyond 2017 and would still make me smile. There’s something so endearing about my cats while they snooze and, now that I see another 12 of them, I see it isn’t just mine that make me smile as they sleep. See all the products at their online shop. Be prepared for some huge uncontrollable grins to break up the holiday stress!